Kate Jasper, Marin County, California’s own organically grown amateur sleuth, returns in this sixth mystery in the series. Kate is considering writing something besides jokes on the sides of coffee mugs for her gag gift company, Jest Gifts. To her own embarrassment, the stuff she is writing is poetry. 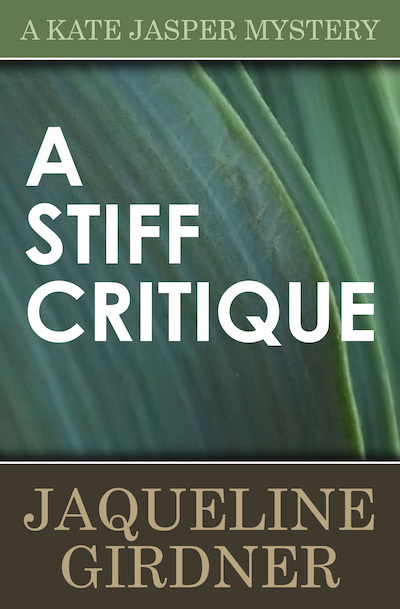 In A Stiff Critique, she joins a writers’ critique group with her friend Carrie, hoping for sensitive support. But the group’s criticisms are more cruel than supportive, especially the verbal abuse from successful thriller novelist Slade Skinner (born Sherman Francis Skinner), uttered with condescension as he pumps a dumbbell up and down. When Slade is found face down on his keyboard with the bloody dumbbell beside him, no one seems surprised by the poetic justice. After all, writing is murder. But Kate wants the real story on the killing, before someone in the group plots the next chapter.